BRIGHTON, Mich.- The Ford F-Series has been America’s best selling truck for 35 years, and it is no wonder why with all that it has to offer. With outstanding performance and best-in-class in so many categories. Plus the options are extensive for the 2013 Ford F-150 with 9 models including the all-new limited. The Ford F-150 is ahead of the rest in the performance department. This tough truck is best-in-class with 411 horsepower with the available 6.2L 2-valve V8. Also, offering best-in-class for Torque of 420 lb-ft with the available 3.5L EcoBoost and 434 lb-ft with available 6.2L 2-valve V8. Tow whatever you need with the best-in-class towing of 11,300 lbs. Keep what you are towing under control with Standard trailer sway control and available trailer brake controller. In addition to the top of the line towing and performance the Ford F-150 offers the best payload and EcoBoost. 2013 introduces modern advances with the Limited trim introduced, the FX 4x4 model now having standard Hill Descent Control, new grille designs and a voice activated navigation package. 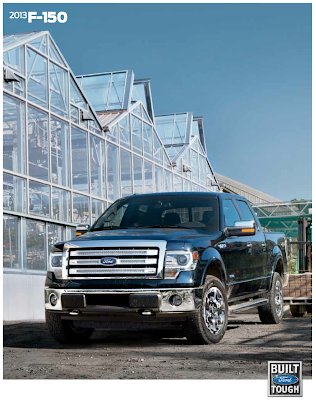 The 2013 Ford F-150 blends versatility, excellent fuel economy and reliability. The Ford F-Series is sure to continue to be a crowd pleaser. Check out the F-150s at our dealership or see all of the specifics in our 2013 Ford F-150 Brochure. Brighton Ford is located at 8240 Grand River Ave. just north of I-96 in Brighton. We are a family owned and operated business that is committed to customer satisfaction. For more information on Brighton Ford visit BrightonFord.com or give us a call at (800) 836-8206.